The deadline to introduce new bills to the California legislature was Friday, so a slew of new legislation is currently being assigned to committees for hearing. Some of them are so-called “spot” bills, as in “hold a spot in line for me, bub,” containing a bare minimum of information, with the plan being to shape them in legislative discussion. All of them are likely to be amended before reaching a vote, and they must go through two voting processes (one in each house) before being passed on to the governor to be signed. Meanwhile, they give some clues about what our lawmakers are thinking about. 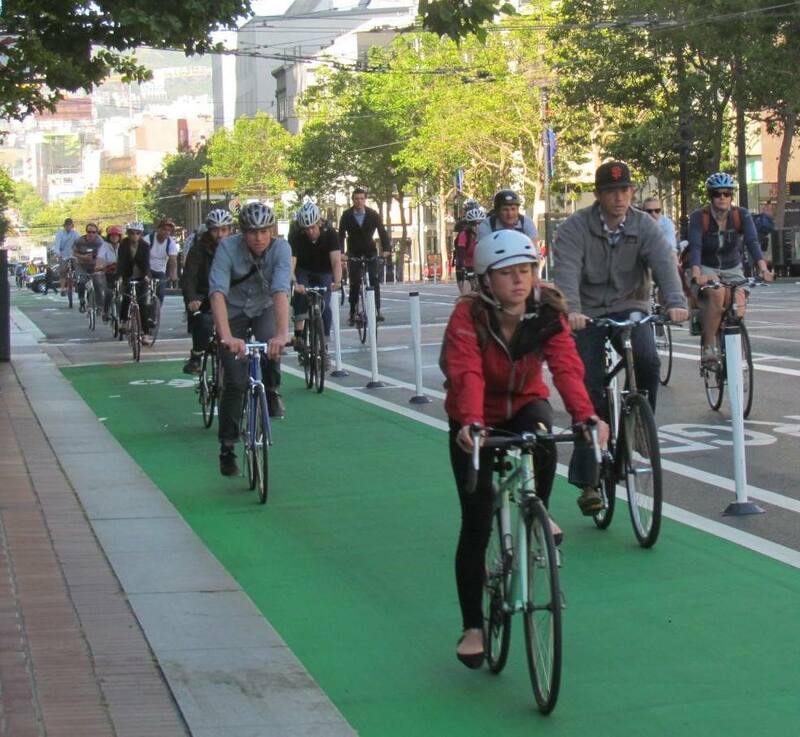 Here are the bills in play that could potentially impact livable streets. Vulnerable Road Users Law: Asm. Marc Levine (D-San Rafael) introduced A.B. 2398, which raises the fines charged when drivers cause injury to “vulnerable road users,” defined as pedestrians, bicyclists, and people using farm equipment and riding horses. The bill is loosely modeled on an existing law in Oregon, but the fines in this bill are minuscule, and sanctions don’t include the community service or required license suspension of the Oregon law. Also, both laws depend on how the police assign responsibility for crashes — a significant flaw. For more on the Oregon law, see this interesting discussion from a Portland bike lawyer which predates its enactment, but could offer some guidance as the CA bill moves through the legislature. Bicycle Tax: Senator Mark DeSaulnier (D-Concord) has proposed S.B. 1183, which would allow local jurisdictions to set a tax on bike sales. Funds from the tax would go towards trail improvement and maintenance. Cyclelicious got this right, pointing out that while bike tax proponents argue that the tax would provide “political credibility that cyclists pay their way,” this is a “bankrupt excuse of an argument,” since road infrastructure is disproportionately bankrolled by non-drivers through general taxes. Redefining Electric Bicycles: Asm. Steven Bradford (D-Gardena) put forward A.B. 2173, which would define electric bicycles with motors that are limited to a top speed of 20 mph as “low-speed” electric bikes, and allow them to ride in bike lanes and on bike paths and trails. 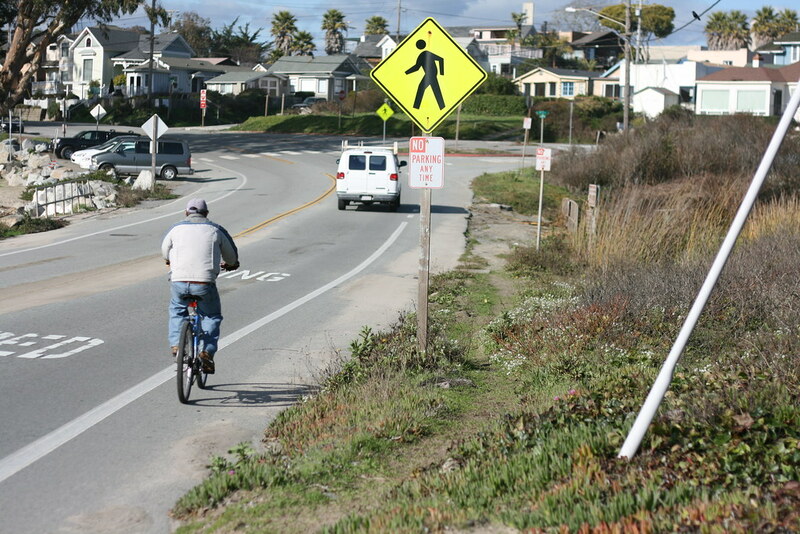 A couple of alternatives: Caltrans could just follow the advice in the recent SSTI report and adopt NACTO design guidelines, which already include a section on cycle tracks, rendering the bill moot. Or, with the right amendments, this bill could be the vehicle for that report’s recommendation to eliminate Caltrans’ oversight of bicycle facilities in the state. Stay tuned. School District Planning: School districts have separate planning departments with their own methods and priorities that don’t always mesh with those of their surrounding communities. A.B. 1179, introduced by Asm. Raul Bocanegra (D-Pacoima) last year, was an attempt to merge school district planning into regional planning efforts. Last year’s bill was gutted in discussion. This year’s iteration is reduced to creating a spot for the Superintendent of Public Instruction on the Strategic Growth Council, which is the interagency group charged with figuring out how to meet the state’s climate change goals. California needs much stronger efforts to bring schools into regional planning processes than this, since schools have such a big influence on where people choose to live. School Zone Violations: In the Senate, Sen. Anthony Cannella (R-Ceres) introduced S.B. 1151, which would double fines for traffic violations near schools and use the proceeds to fund the Active Transportation Program, under whose umbrella Safe Routes to Schools Programs are funded. This would make fines for traffic violations in school zones equal to those in construction zones. Increased Penalties for Hit and Run Drivers – Asm. Mike Gatto (D-L.A.) introduced A.B. 1532 legislation that requires at least six month of driver’s license suspension for any driver found guilty of a hit and run, regardless of whether or not someone was seriously hurt in the crash. The intent of Gatto’s legislation is to balance the penalty for hit-and-run crimes with those for drunk driving misdemeanors and felonies. This effort follows a new law Gatto authored last year that increased the statute of limitations for hit-and-run crashes. Carbon Tax on Fuels: A bunch of bills want to control how revenue from cap-and-trade is applied (see below), but none directly address the market mechanisms used to control greenhouse gas emissions except for Darrell Steinberg’s (D-Sacramento) proposal to replace cap-and-trade with a carbon tax, S.B. 1156. Cap-and-trade is scheduled to apply to fuels starting next year. Money from Cap-and-Trade: Senators Ricardo Lara (D-Long Beach/Huntington Park), Fran Pavley (D-Agoura Hills), and Assemblymember Shannon Grove (R-Bakersfield) have each introduced bills that designate a specific use of cap-and-trade funds: S.B. 1204 (Lara and Pavley) would fund the technological development of zero emission trucks and buses; S.B. 1122 (Pavley) would designate funds for regional Sustainable Communities Strategies and the Alternative Transportation Program; A.B. 1639 (Grove) would clarify that the intent of the legislation is to use the funds specifically for cost-effective reductions in greenhouse gas emissions. Many of these bills will transform in the hearing process, morphing and perhaps combining until the very last minute (hopefully with as salubrious effects as S.B. 743‘s last-minute amendments last year). Streetsblog will continue to track and report on these bills and other legislation affecting the state’s transportation and livability landscape. Regarding your proposal that Caltrans adopt the NACTO standards: My understanding is that the design requirements for Class I, II, III bikeways in ingrained into state law, so it may not be as simple as that. This is great, but I feel like it will lead to more hit and runs. Thanks for the great legal roundup! Just to clarify, though, the dubious legality of the Specialized Turbo e-bike doesn’t have anything to do with the proposed legislation, which wouldn’t affect the usage of any e-bikes beyond keeping municipalities from banning them from using bike paths and trails (e-bikes that are regulated with a top speed of 20mph are already allowed in bike lanes). Oh yes, the bike tax. Please, do implement this. I recommend also the fruits and vegetable tax, a tax on walking, and a tax on hugging people. With all the extra revenue we can finally eliminate the gas tax, the cigarette tax, and property tax. I think separate motorcycle lanes on freeways would allow more people to ride motorcycles on freeways safely. this would reduce cars on freeways and get freeways moving. That then would reduce cars on surface streets and make bikes significantly safer since there would be less cars on surface streets. Big hug needs to pay their own way. Someone hugged right next to me and scared an old lady. They should be licensed and carry insurance. I would support this more if there was regulation around restricting the noise of motorcycles when driving through neighborhoods and commercial areas. Also, removing cars off the road can induce demand for more driving. That’s not necessarily a bad thing, but freeways tend to return to congestion when capacity is added. The Oregon fine is $12,500, not just $145. A mere $145 is not high enough to be a disincentive. Littering is $1000. Are we sending the message that human life is worth 1/7th of trash? Setting fines clearly below disincentive levels can actually have the opposite affect, as the message is sent that society places a low value and low priority on the violation. Propose something actually similar to the Oregon law. If it gets shot down, then the publicity will rally the troops to push for it the next year, until we get a true disincentive. This would send a strong message, which in itself may be worth more than the actual bill. We should not show up to the bargaining table with an extreme low-ball bid which may end up actually costing lives. To contact Marc Levine’s staff…..
should be moving with traffic, not zooming past it. Electric motorcycles are cool, gasoline ones can make as much pollution as 50 cars. There is a CA noise law for motorcycles. CHP and local police love hogs and ignore it. We need to press our mayors for enforcement of the vehicle code. Ignoramus. Engage your pathetic brain and consider that people with disabilities such as knee and hip replacements ride electric bikes. What Happens to Transportation Reform if A.B. 32 Does Get Repealed?